As promised here are some other things I’ve been working on this speedy summer–where has it gone??!! 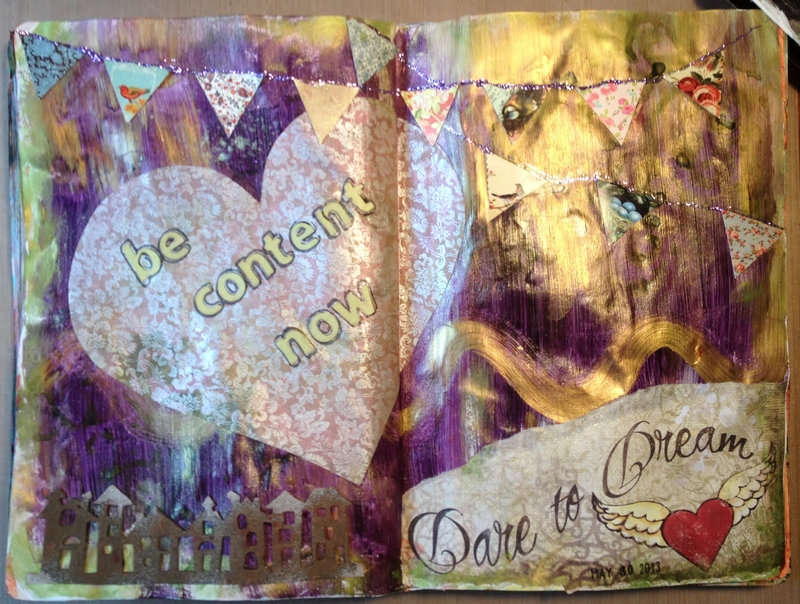 My arting time has been more sparse than I prefer but I have been doing some creating! 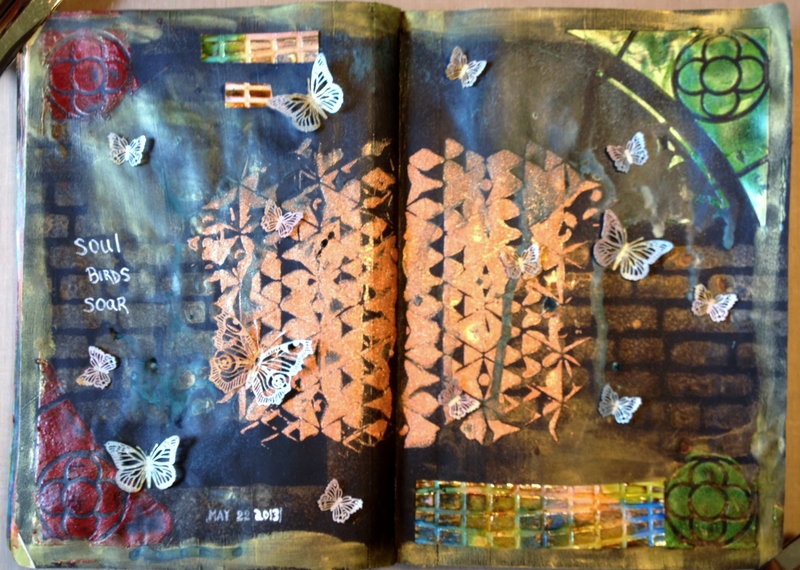 Here are a few art journal pages I’ve done this summer. 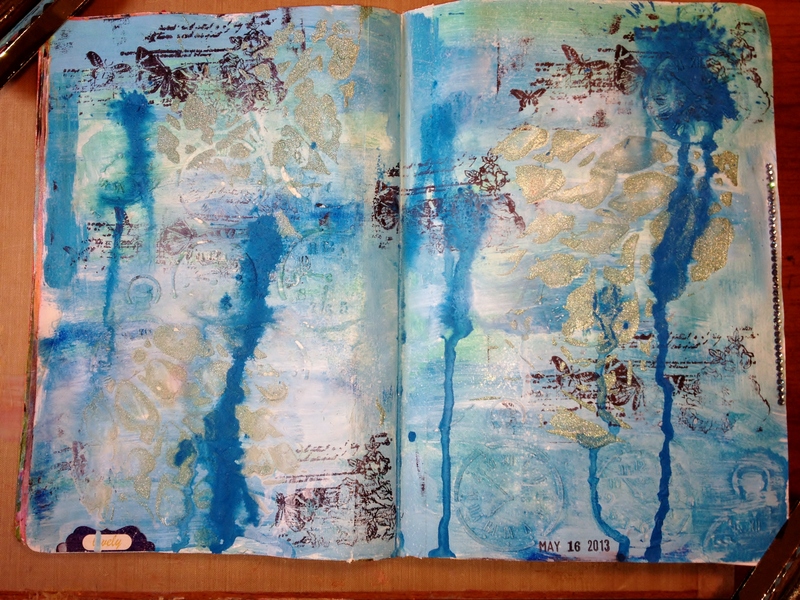 I am still enjoying working in my art journal and experimenting with new ideas, supplies, and techniques. I have been putting tape over my center seam on every set of pages to prevent bleed-through. I have also been gessoing every page for better “tooth”. This page I did some paint washing and then stamping and used some felt letters. Acrylic paint over gesso, metallic paint, banner with Stickles “stringer”, stamping, outlined lettering, papers from stash. Love the patterned paper I bought in a grab bag and also love the big bloom stamps and little poppy scraps from my stash. Acrylic paint on the edges. 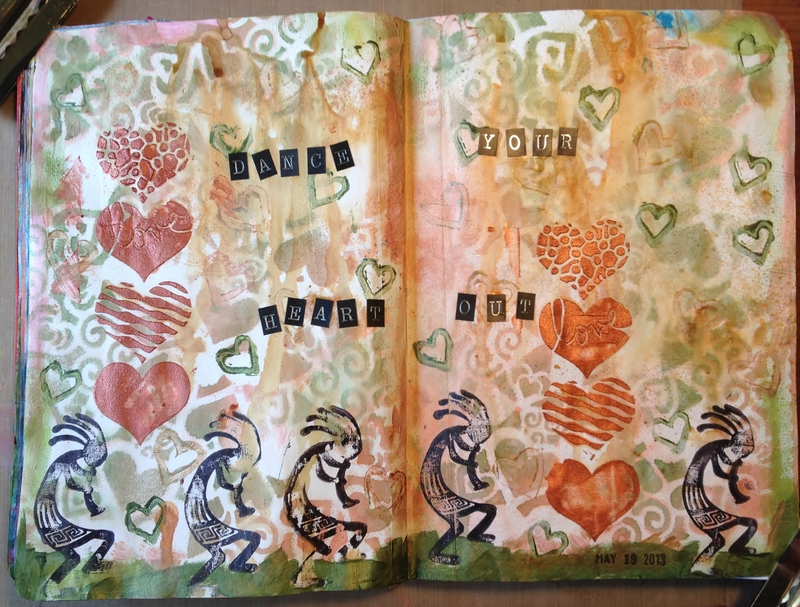 One of my fav pages–hearts everywhere!! Heart stencils, heart stamps, hearts for everyone! Must’ve been a blue day huh? 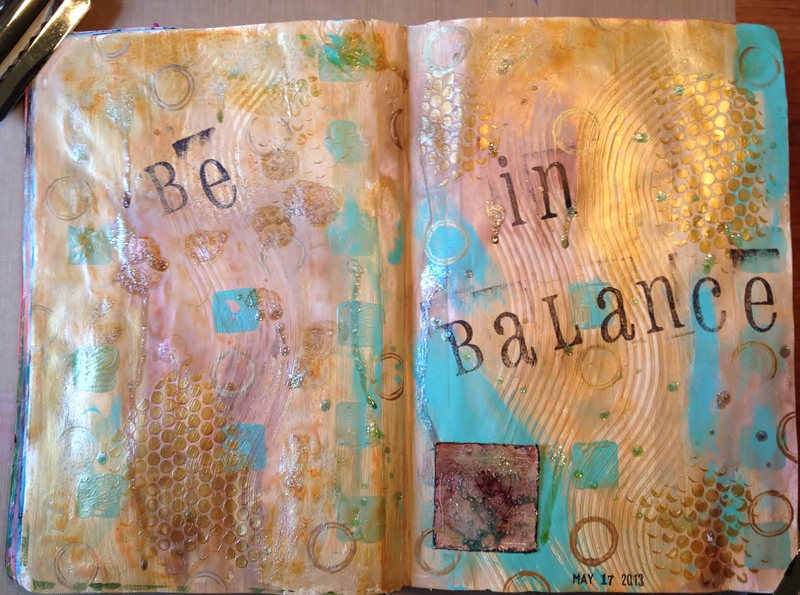 Dylusions mists, Inkagold sparkly 3d paint, stamps, modeling paste. Fun and free flowing! Experimenting with black gesso. 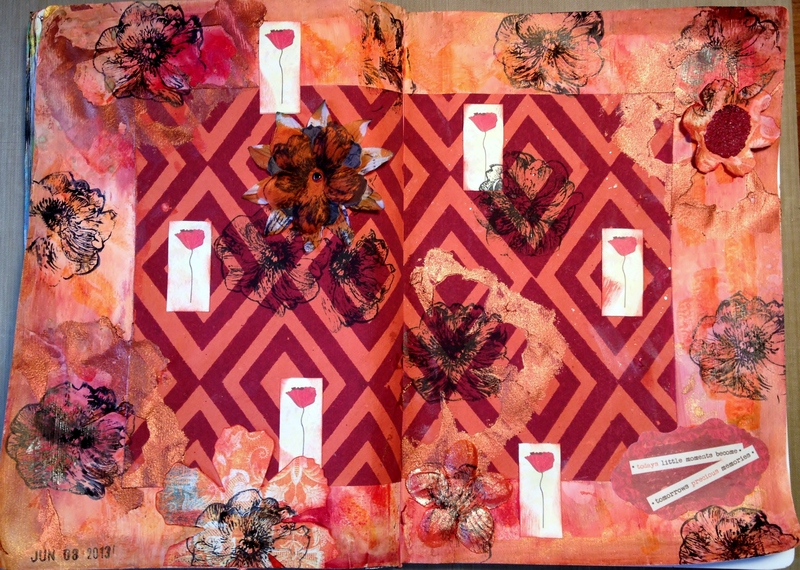 One of the points of art journaling for me is that I want to use up some of those bits and bobs that are left over from projects. Too small to be a project on their own but I can’t bear to part with them. 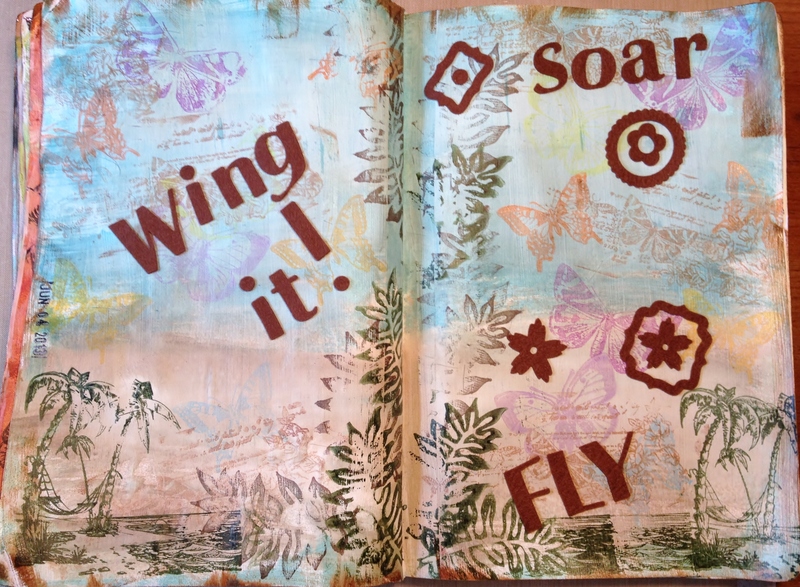 This page uses modeling paste colored with alcohol inks, embossed metal that is painted with gesso and alcohol inks, tiny laser cut butterflies colored with Smooch inks. Last but not least…muted soft beachy colors and metallic acrylic paint. I textured the page with bubble wrap, and a piece of cardboard cut so it had teeth, a cardboard roll was used to make circular patterns along with a foam circle and square shapes. Thank you very much Pauline! Hope you have a colorful creative day! Girl, you’re on a roll. All of your pages a beautiful. I still need to get back in the groove. You are right the summer flew by. Hi Donna! So happy to hear from you! Thanks for checking me out here. I’m sure you’ve been having a fun-filled and busy summer with your sons and their families. Now go make something today! !